Here are some questions that often arise. Feel free to call us any time with any questions! 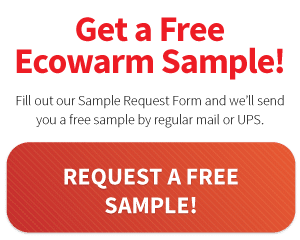 Can Ecowarm RadiantBoard heat all types of rooms? Flooring height challenges can arise, particularly with radiant floor remodels. Ecowarm RadiantBoard is ¾” thick which is very thin for a radiant thermal mass. But even that is sometimes a problem. Sometimes you may need to shave ¾” off the bottom of a door if code permits. Sometimes you may need to add ¾” to your stair treads to keep the rise consistent. When is Ecowarm RadiantBoard installed? Ecowarm RadiantBoard is typically installed just prior to the installation of finished flooring goods. Store Ecowarm RadiantBoard on the job site in a dry, cool space until it is ready to be installed, in the natural progression of construction. Is Ecowarm RadiantBoard really that efficient? Well, Yes. Other higher mass concrete type systems have a lot of mass, which may sound good but they have some resistance and more response time issues. Underfloor systems have both high heat transfer resistance and heat loss opportunities resulting in higher operating costs. You want a system close to the flooring goods with high heat transfer characteristics…like RadiantBoard. Will Ecowarm RadiantBoard heat the surface evenly? Due to the popularity of tankless water heaters, people often ask whether they are a good choice for use with radiant floor heating. The short answer is that they can be made to work but they are a poor choice. Radiant heat systems heat sources should be dedicated closed-loop systems, not exposed to potable water, for long and reliable service. Tankless water systems modulate their flame according to domestic water demand but they were not designed to modulate properly in a closed loop hydronic system. They are very low mass with the propensity to cycle often unless a one employs a buffer tank (cost and complication). They have a very high-pressure drop through their heat exchangers requiring high head (high energy use) circulator to extract the energy from the heat exchanger. Their charm is that they are relatively cheap compared to boilers. If you want an instantaneous water heater, we recommend that you purchase a combi boiler. A combi boiler is a typical wall hung boiler with an internal extra heat exchanger that generates domestic hot water and closed loop hydronic heating in one unit. These are very popular in Europe, Asia and now the U.S. They also usually have an internal hydronic circulator, vents, and controls that reduce piping and installed cost. Could tubing leaks destroy the Ecowarm RadiantBoard? Leaks sometimes occur during construction, primarily due to conflicting trades. The PEX tubing can be lifted out of the groove at the leak, the groove routed to a larger size and a crimped or connected with a compression fitting. After the construction phase, leak concerns should rest with plumbing leaks, not the radiant system. To be safe, we recommend that the hydronic system is isolated from the pressurized plumbing system by a ball valve, not an auto-refill valve. Radiant panel systems that use composite boards such as MDF and OSB are more prone to swelling and distorting if exposed to water for prolonged periods of time. Can I glue hardwood and carpet to Ecowarm RadiantBoard? Yes, you can use adhesives to glue hardwood to Ecowarm RadiantBoard as specified in our Installation Manual page 30. Can I install a mortar bed over Ecowarm RadiantBoard? Can Ecowarm RadiantBoard heat rooms with tall ceilings? Yes, radiant floor heating and Ecowarm RadiantBoard specifically are an excellent means of heating rooms with tall ceilings. Radiant largely heats objects, not the air, dramatically reducing the problem of hot air stacking in the ceilings. This phenomenon also reduces your heating bill. There is no good reason to overheat a tall ceiling, as happens with rising hot air with forced air systems. 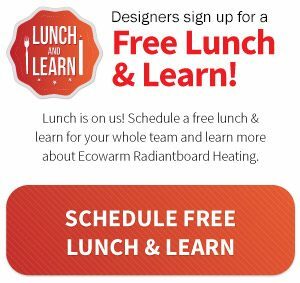 How long does it take to install Ecowarm RadiantBoard? Well, it really does depend. If your plan has lots of open space and few tight locations, that makes it faster (fewer cuts and fussing). If your installer has some experience, that really helps. So, planning on 250-500 sq ft per day is reasonable with two people. How do I select manifold locations?